The AMPL SmartBag is an all-in-one solution for the tech-heavy travellers of today. If you were Phileas Fogg, it would be your Passpartout - carrying and looking after all your stuff. If Phileas Fogg had a SmartBag, he would have thrown Passpartout in the Suez Canal. Anyway. 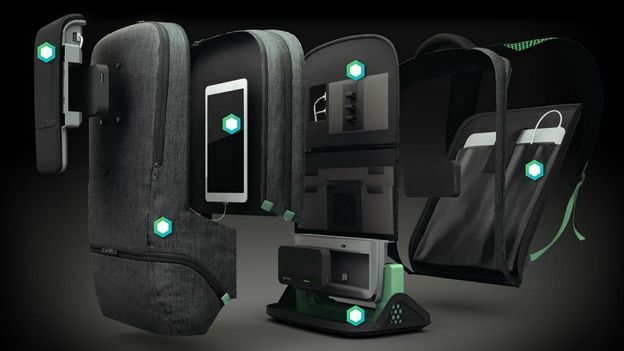 Every single pocket has an integrated charging port for your gadgets, connected to an internal battery, which has capacity to charge a smartphone 2-3 times off a full charge. But, the 'Power Centre' section of the bag has space for up to three expansion batteries, letting you charge multiple devices simultaneously, including larger capacity devices like laptops and tablets. This bag isn't just a giant battery though - it has street smarts too. The brains of the operation live in a moulded scratch-resistant nylon housing, where the bag intelligently routes power to devices that need it most. There's even an OLED display that shows you everything that's going on inside the bag. Or failing that, you can connect via Bluetooth LE 4.0 to your phone, where the AMPL app tells you how juicy your devices are looking, as well as buzzing at you if you happen to leave your bag behind somewhere. And thankfully, the whole lot is built out of tough, hard-wearing nylon with extra foam padding and water-resistant coating, making it light, waterproof and shock-absorbant. After picking up two awards at CES 2015, AMPL is working hard to get the bag to consumers this year. Check out the AMPL Labs website for more information!